Normally a trip to the Oregon coast brings to mind visions of sweeping sandy beaches, crashing waves, and windswept dunes. If you time your visit carefully to match with low tides, however, you can take advantage of otherwise hidden beauty along the rockier areas of coastline. Below the surface, sea urchins and sea stars move slowly over the rocks in search of prey. Anenomes gently open and close their tentacles as they sting and stun both prey and predators alike. Close examination will reveal tiny sculpin darting in the shadows as crabs scuttle across the rocks. Low tides expose these rocky areas and leave behind the tide pools that teem with sea life and allow us to get a close view of these amazing ecosystems. The animals and plants that live in these areas must be capable of withstanding quickly changing diverse conditions, from warm sunny summer days to freezing winter, not to mention the rapid salinity changes that are also common during heavy rains which frequent the coast. Despite their resilience, species in these fragile environments struggle to meet larger environmental challenges. Current changes to ocean acidity, temperatures, and other factors have resulted in an epidemic of sea star die-offs, coral bleaching, and declining populations of fauna. Oregon has chosen to protect important nesting areas for seabirds, delicate coastal habitat, and sanctuaries for marine mammals, crustaceans, shellfish and other marine wildlife through the establishment of reserves, refuges, and gardens. This allows for a better understanding of the issues that impact these ecosystems as well as protections from direct human impacts for truly critical portions of marine habitat. There are so many places you can go on the Oregon Coast to explore the rich intertidal ecosystem. A few considerations should be kept in mind when planning a visit on your own, and various groups and areas also offer educational programming to get even more out of a trip to see Oregon's many tide pools. Oregon Marine Reserves are sections of the Oregon Coast set aside to protect species biodiversity and geological formations that would otherwise be negatively impacted by visitors and use. 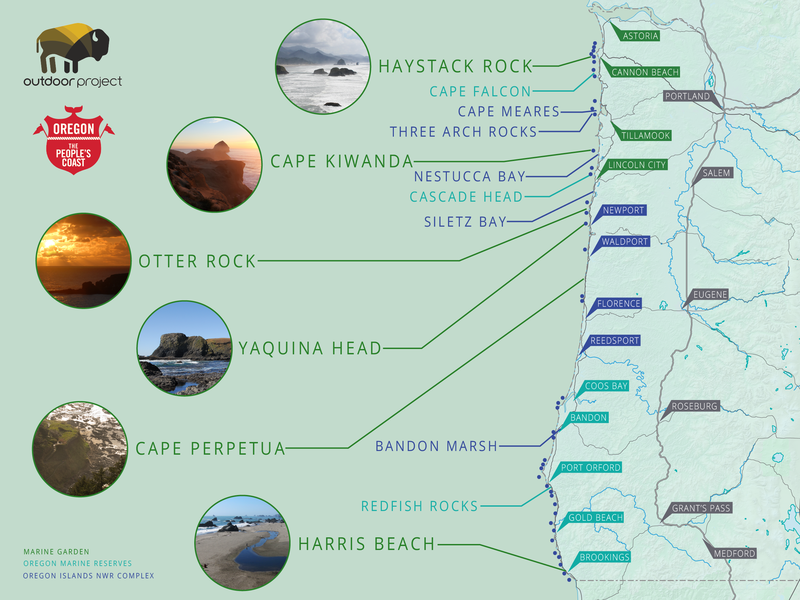 There are five reserves: Cape Falcon, Cascade Head, Otter Rock, Cape Perpetua, and Redfish Rocks. Some of these marine reserves have accessible marine protected areas adjacent to them. Visitors to these areas may walk on the beach and collect small shells and agates, but all other collecting is prohibited. The Oregon National Wildlife Refuge Complex is a chain of six refuges composed of hundreds of small rocky islands along the Oregon Coast. Individually, these are the Oregon Islands NWR, Three Arch Rocks NWR, Cape Meares NWR, Bandon Marsh NWR, Nestucca Bay NWR, and Siletz Bay NWR. The six refuges protect a diverse collection of bird species that rely on the islands for habitat. Climbing on the islands of these refuges is strictly prohibited. Marine gardens are special areas that serve as sites for educational programs that allow visitors to enjoy and learn about the intertidal zones. State designations prohibit all foraging or collecting at these sites. There are seven marine gardens along the Oregon Coast: Haystack Rock, Cape Kiwanda, Otter Rock, Yaquina Head, Yachats State Park, Cape Perpetua, and Harris Beach State Park. These areas are excellent locations to explore the variety of plant and animal life that tide pools have to offer. 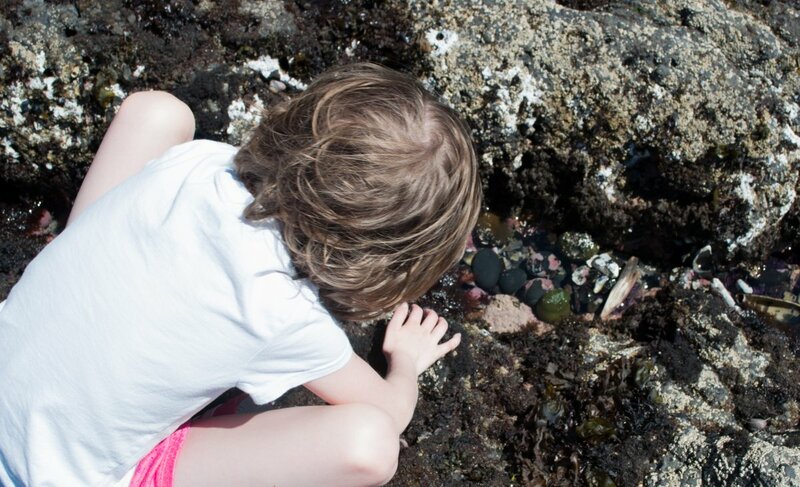 Tide pools are fun to explore, and offer adults and kids an opportunity to experience marine ecosystems. With this in mind, there are some important considerations to remember when exploring these special gardens. Leave No Trace principles apply as much to tide pools as to trails. Barnacles, mussels, snails, and even hermit crabs may be present on the tops of exposed rocks, and seaweed may also hide delicate soft-tissue tidal animals. Exploring on bare rock whenever possible protects animals exposed above the water line, and applying direct, firm pressure on hard-shelled animals is better than taking leaping or twisting steps. Due to their small size and limited mobility, some of the delicate creatures that live in tide pools may spend their entire life cycle within just one pool. Although it can be tempting to pick up animals to show your friends and family, calling your fellow explorers over to you to show them what you find allows the animals and plants to remain attached to the places they call home. These animals can be vulnerable to predation, and once removed, they may not easily reattach. If an animal isn't attached to anything, picking it up is an okay choice, and it is generally acceptable to pick up animals on sand. This etiquette applies to sea stars as well, but given the current threat to sea stars from sea star wasting disease, which reached epidemic proportions in 2015, it's best to leave these animals alone altogether. Anemones should also only be touched with caution. Anemones use stinging cells, called nematocysts, to stun prey and frighten predators. For most people, the sensation when stung is a light tingle, but for some humans, these stings can cause an allergic reaction. It is generally best to refrain from touching anemones, and if you do touch them, the waving tentacles are a safer choice than the center of the animal. Poking an anemone can cause it to squirt out valuable water it needs to survive during low tide. As with other tide pool wildlife, gentle observation is the kinder choice. If you want to look at creatures under rocks, rocks should be lifted up to view the animals and then gently placed back in its original position. Rolling the rocks aside risks damaging nearby animals. Finally, keep in mind that jellyfish in the Pacific Northwest that have any color can provide a painful sting, and large crabs can also pack a nasty pinch. Peering in to hunt for tiny fish in tide pools along the Oregon Coast. Photo by Vanessa Davids. While foraging is strictly prohibited in protected areas, Oregon Ocean Shore State Recreation Areas rules and regulations allow limited foraging in other tide pool areas. Oregon Department of Fish and Wildlife (ODFW) regulates the recreational taking of shellfish, and exact take rules are located on their website. For those new to the shellfish harvesting, free clamming and crabbing clinics offered by Lincoln City Visitor’s Bureau might be useful. Bill Lackner, an instructor from Lincoln City, can be reached at 1.541.265.5847 to get information on or sign up for upcoming classes. Interestingly, different agencies regulate and protect specific parts of the tidal zone. Oregon State Parks manages the tide pools themselves, ODFW manages any actual creatures living within the pools, plant or animal, and U.S. Fish and Wildlife Service manages anything above the splash line, such as birds and ocean mammals. While visiting the coastline, make sure to keep beach safety in mind. The best time to visit tide pools is during low tide, and tide books specific to the beach you are visiting can be found in many gift shops in the small towns that dot the coast. Whatever the tide, sneaker waves can still be a problem depending on your location, even during low water. These waves, which are larger than normal and come unexpectedly, are more likely during and just after storms. Assuming high waves can reach you, wherever you are on the beach will keep you safer. Steep and overhanging cliffs from erosion can cause a collapse of land down onto the beach. Pets require special consideration in tidal areas. The sharp rocks, mussels, and barnacles can easily cut delicate paws. Along the North Coast, Haystack Rock has seasonal interpreters that offer displays, microscopes, bird stations with spotting scopes, and tide pool rangers to answer questions through the Haystack Rock Awareness Program run by the city of Cannon Beach. Ecola State Park and Oswald West State Park also offer seasonal rocky shore interpretive programs. Along the Central Coast, Yaquina Head Outstanding Natural Area has a visitor center and guided tide pool walks. The Oregon Coast Aquarium and Hatfield Marine Science Center both offer touch tanks and copious information about the sea life found on Oregon's beaches. Hatfield Marine Science Center also offers Quest Books in its gift shop. These books lead families on 24 clue-directed hunts in four counties to explore parks, trails, and other outdoor spaces in new ways and at their own pace. Seal Rock State Recreation Area, Yachats State Recreation Area, and Cape Perpetua Visitors Center all have a seasonal rocky shore interpretive ranger who works in the tide pools. Carl G. Washburne State Park offers seasonal rocky shore programs both at the campground and at the Strawberry Hill wayside in Neptune State Park. For the South Coast visitor, Shoreline Education for Awareness, a non-profit dedicated to awareness and education about shoreline habitats, offers programs in at Coquille Point in the spring and at the Simpson Reef Overlook in the summer. For those looking to gain more in-depth knowledge, Shoreline Education for Awareness also presents a series of training seminars for its seasonal interpreters each winter that are open to the public on a space available basis. Sunset Bay State Park and Harris Beach State Park both offer seasonal rocky shore interpreters that offer campground and tide pool programs. For more information as well as camping reservations at any of the state parks, visit Oregon State Parks online or call 1.800.452.5687.